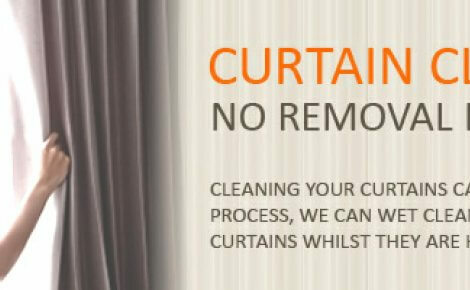 How to Clean,Wash and Dry Curtains :: My Cleaners London - Only professional cleaning! 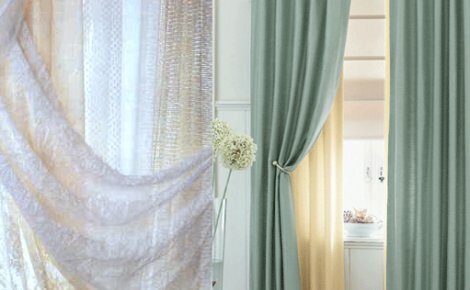 Curtains are an elegant addition to homes but are often neglected. They look so lovely when you first put them up but you really don't realize how much dust and dirt they collect until, years later, you whisk them open to let the sun in and a cloud of dust circles the air. Now you are faced with two decisions: wash or replace. These days, draperies are inexpensive, and people change home decor themes often. When the curtains begin to look dingy, they simply buy new ones – usually as an excuse to redecorate. While we’d never discourage redecorating, there are plenty of reasons to clean your curtains more often than you do now. Curtains are usually filthy, and with good reason. They are the barrier between outside and inside. When your windows are open, the curtains absorb moisture and attract dirt from the outside. When your windows are closed, there are cracks and drafts. If air can get through, so can tiny dirt particles. Draperies are also the places where dust and dirt from ceiling fans and air vents settle. Even normal dusting and vacuuming causes dust and debris to circulate further into the air. A number of those particles will settle onto your curtains. No matter how dirty and dusty your curtains get, it would be way too much work to wash them or have them cleaned every week. It would also ruin your drapes. You can, however, get a lot of the dirt and dust off the surface of your curtains by dusting or vacuuming them every week as part of your general household cleaning. You can use a feather duster, static duster, dusting cloths, a damp cloth, or a dusting attachment that fits onto your vacuum cleaner. Start at the top of your curtains and work your way down so the dust falls onto parts you haven’t dusted yet. Concentrate on dusting hems and folds as most of the dust accumulates in those areas. If you use a damp cloth, make sure you dust or vacuum the curtains first to avoid smearing in dirt. It’s best not to use a damp cloth on lightly colored curtains. It’s easier to leave your curtains hanging when you dust them. Consider getting a more secure curtain rod if you aren’t able to hold the curtains taught to vacuum or dust them. Be sure to dust or vacuum both sides of your curtains. Dust and debris collects on the sides facing windows as well, and it can fall onto your floor, cause odor, or cause particles to become airborne allergens. But before using a steam cleaner on your curtains, check the manufacturer’s label to be sure steam cleaning is acceptable. If the curtains are machine washable, steam cleaning should be fine, but they will likely clean up much better if tossed into a washing machine. If you steam clean the curtains yourself, follow the steam cleaner and curtain manufacturer directions. Do not leave the windows open while the curtains are drying. Let them dry undisturbed without attracting airborne dirt and debris from outside. You should avoid dusting and cleaning the house right after steam cleaning your curtains. Professional carpet cleaners will usually offer drapery cleaning as well. 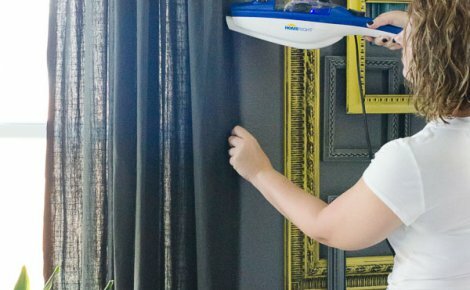 Machine washable curtains are the easiest and least expensive to clean. There are some tricks to getting the best results. Caution is warranted because the sun does strange things to fabrics, and the fibers become weakened. Curtain fabrics have been put through a lot of abuse. Washing them abuses them more, and it can actually shorten the life of your drapes. The longer you can go before washing your curtains for the first time, the better. If your curtains are in direct sunlight, exposed to cold or heat can cause the fabric to fade. Your curtains are likely to be faded on the side that faces the window. Be sure to hang them back in the same way so the faded side faces out. Use a lint brush to remove embedded dirt and grime if regular vacuuming and dusting doesn't get all of the hairs and dirt particles. A damp cloth can sometimes help your curtains look better. For a general “freshening” of your curtains, you can put them into your dryer on low or tumble dry after spraying a little Febreeze on them. Avoid using fabric softener sheets as they can sometimes stain fabrics, leaving a grease mark or sheen spot. If your curtain labels say, “Dry Clean Only,” it’s important to follow the directions. Keep in mind, though, that all dry cleaners are not the same. Your neighborhood dry cleaner might not be knowledgeable about different fabrics. They might send their cleaning out to other facilities that may or may not correctly clean your draperies. It’s important to do a little research before you take your curtains to an establishment. Ask friends and family for references, and talk to the manager at the local dry cleaners. 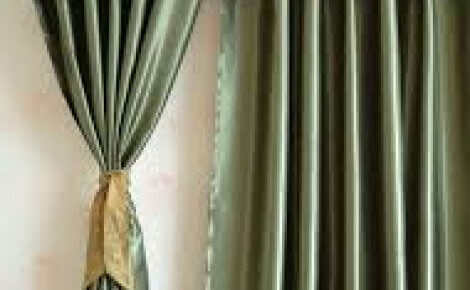 Unless your curtains are very inexpensive and easily replaceable, you should be careful about where you take them to be cleaned. Our lesson is over. Have fun and good luck.